The eleventh edition of the International Computer Vision Summer School aims to provide both an objective and clear overview and an in-depth analysis of the state-of-the-art research in Computer Vision. The last decade has seen a revolution in the theory and application of computer vision and machine learning. In this edition we look at the topics of Representation, Action and Interaction. The school will be open to about 100 qualified, motivated and pre-selected candidates. Master Students, Ph. D. students, Post-Docs, young researchers (both academic and industrial), senior researchers (both academic and industrial) or academic/industrial professionals are encouraged to apply (a confirmation email will be sent to you). Each student is strongly encouraged to submit also a reference letter (Reference letter Module) by email (icvss@dmi.unict.it) to the attention of Prof. Battiato Sebastiano and Dr. Giovanni Maria Farinella. The expected school fee will be in the order of €525 for Master and Phd students, €750 for other academic positions and €960 for all the others. The fee will include all course materials, coffee breaks, bus service from Catania Airport to School Location and viceversa, WiFi Internet Connection, a guided tour, a social dinner, a party on the beach, a folkloristic exhibition and bus service from School Location to Catania, Siracusa and Taormina at the end of the school. 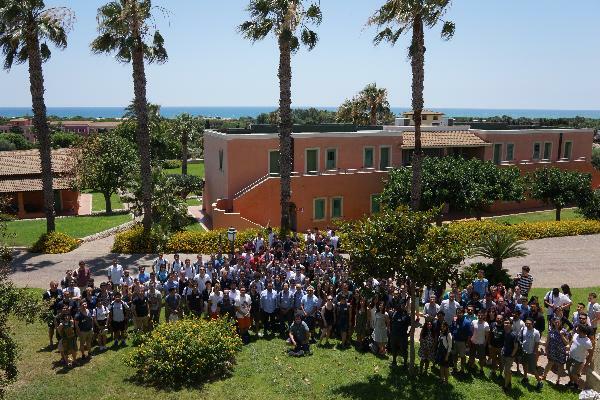 Applications to attend ICVSS 2017 should be received before 31 March 2017. Applicants will receive notification of acceptance by 15 April 2017. Late registration can be done with an extra payment of €150. Applications can be done through the online module. Accepted students may submit a poster to present their research activity. The poster should be submitted before 21 May 2017. Suitable space will be reserved to students for showing their posters. The electronic version of the posters will also be available from the ICVSS web site. More information about the submission procedure is available here. A scholarship of €525 will be awarded to the best PhD student attending the school. The decision will be made by the school committee at the time of the school, taking into account candidates' CVs, poster and oral presentation. All PhD students attending the school will be considered for the grant. A selected subset from the submitted posters will be selected by the school committee for short oral presentation. One best presentation prize of €525 will be given to the best presentation selected by the school committee. During a typical PhD and subsequent research year, students will read probably more than 100 papers. Reading research papers is a skill that can be acquired and that is very different from reading a novel. This session is to introduce students to that skill. Good ideas have deep roots. Understanding such roots is key to being able to generate new ideas moving forward. The main goal of the Reading Group is to practice ways in which exploration of these roots can be performed. The homework prior to the commencement of the school consists in studying (not just reading) one or more of the references provided by the school commitee, and tracing the ideas as far back as you can. Detailed instructions will be sent to students after acceptance notification. This essay competition reflects the importance of considering the "real world" social impact of technology alongside the fundamental goals of basic R&D. Computer Vision is an area of scientific and technological development that will continue to have a profound impact on society. It will redefine the way in which information technology intersects and interfaces with medicine and other disciplines, it will play a key role in the care of an ageing population and it is already a fundamental aspect of modern security technology. Participants in the competition may write a piece of original work on the topic reported below. There are no style guidelines, or "correct answers". You may reference any sources you wish (from any field of thought/endeavor). You may contextualize the discussion to your specific area of investigation and research interest. It is however requested that the discussion be scientific and grounded on current technological and research achievements, e.g. start-ups, patents, publications. There is a strict word limit of 1,500 words, excluding citations and footnotes. Through an entirely subjective, qualitative and irreproducible selection process, one successful essay will have his €525 attendance fees at the ICVSS 2017 reimbursed. The essay competition prize is sponsored by GIRPR. Submissions should be sent in PDF or Word format to icvss@dmi.unict.it. Your name, email address and university/organization should be written at the top of your essay. Deadline for submission is 15 June 2017. The winner of the competition will be announced on 14 July 2017. The essays will be shared with fellow summer school attendees. ICVSS 2017 will be hosted by Hotel Village Baia Samuele in Punta Sampieri - Scicli (Ragusa), Sicily from 9-15 2017. Sicily is one of the most beautiful islands of the Mediterranean. The island is very rich in archeological sites from various Ancient Civilizations. The sea, weather, food and the wine are excellent. The location of the school rises in the middle of an ample bay delimited on the west from Sampieri and on the east from a cliff, on which is founded an ancient furnace, rare example of industrial archaeology. The Hotel Village "Baia Samuele" stretches in a gentle slant to the beach: 120 thousand square meters delimited from rows of secular cypresses. An ultramodern village with an original architecture, pleasant design and all comforts you can imagine. The frame of plants and flowers, typical of this angle of Sicily, in front of the island of Malta, completes this gilded dream of the Mediterranean. ICVSS participants will be hosted at Hotel Village Baia Samuele (school location) at very special rates. ICVSS participants must make reservations for accommodation no later than 10 May 2017, using the accommodation reservation form (Accommodation Reservation Module) to be sent by email directly to Baia Samuele reception (icvss@igrandiviaggi.it). After 10 May 2017 there is no guarantee for reservations in Hotel Village Baia Samuele. Reservation can be done directly on site during the school or by email to: info@eracletravels.it. Information on previous ICVSS editions can be found here.